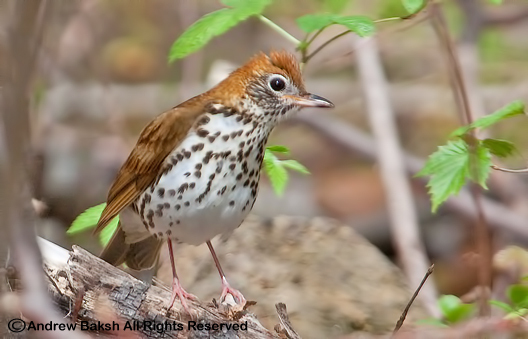 Today's photo feature the Wood Thrush (Hylocichla mustelina), a bird best known for its melodious song. 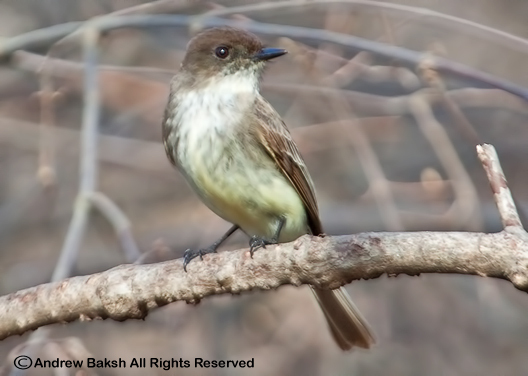 It is a Medium thrush, with rust-brown upperparts and white underparts that is heavily spotted. 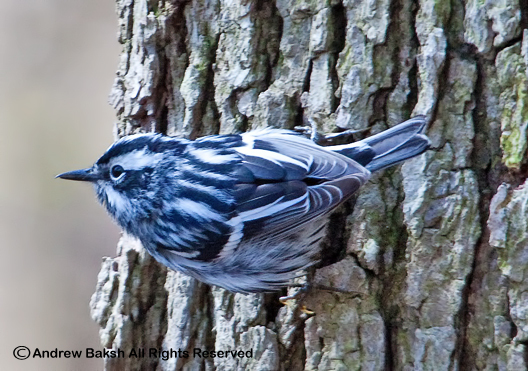 A bird that is considered common, but seldom seen outside the deep woods. 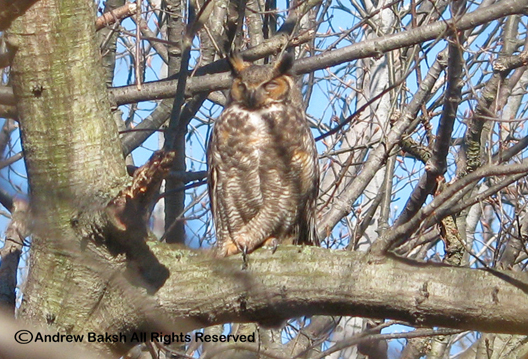 Today, I sat in the woods listening to the sounds of the Wood Thrushes around me and was rewarded with this photo. 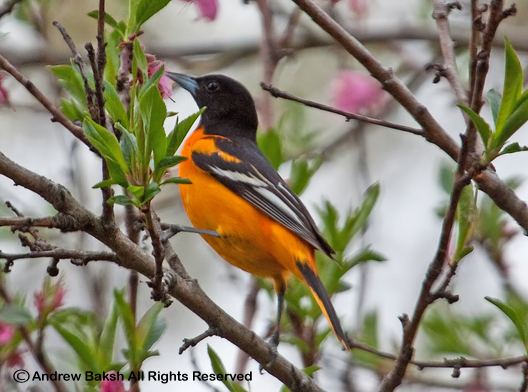 New spring arrivals in the backyard include Northern Flicker (Colaptes auratus), Yellow Warbler (Dendroica petechia), Gray Catbird (Dumetella carolinensis) and Baltimore Orioles (Icterus galbula). 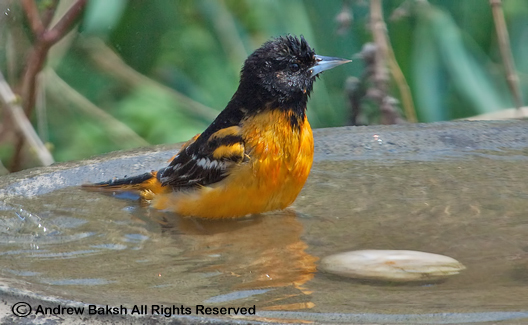 I was able to photograph a few of the Orioles which I have posted below. 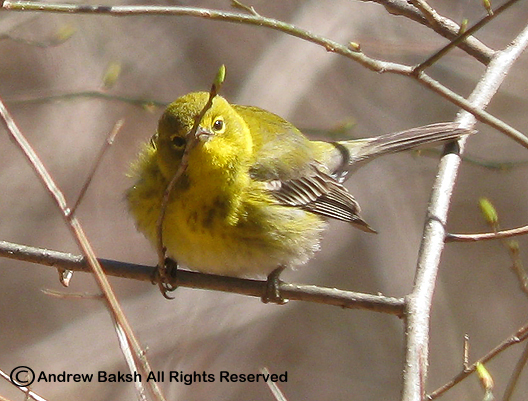 Yesterday, I found this Prairie Warbler, in Prospect Park Brooklyn NY while looking for a reported Brewster's Warbler. Another early arrival! 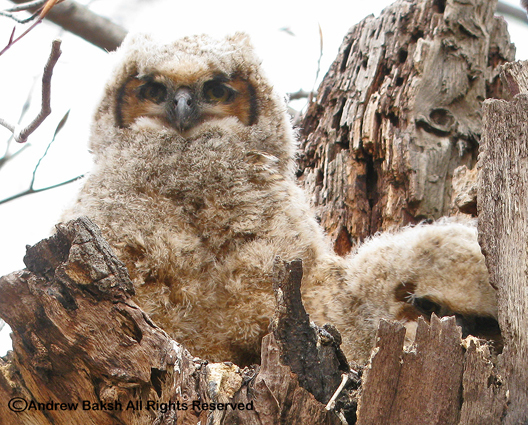 The Great Horned Owlets that I have posted photos on continue to grow quite nicely. This Sunday, I watched one of them stretching its wings. 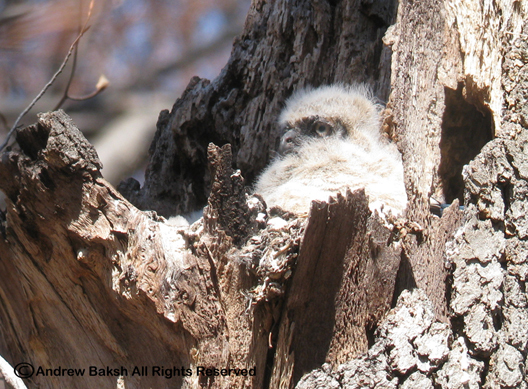 The other seemed shy and was content to peek at me from the corner of the nest. 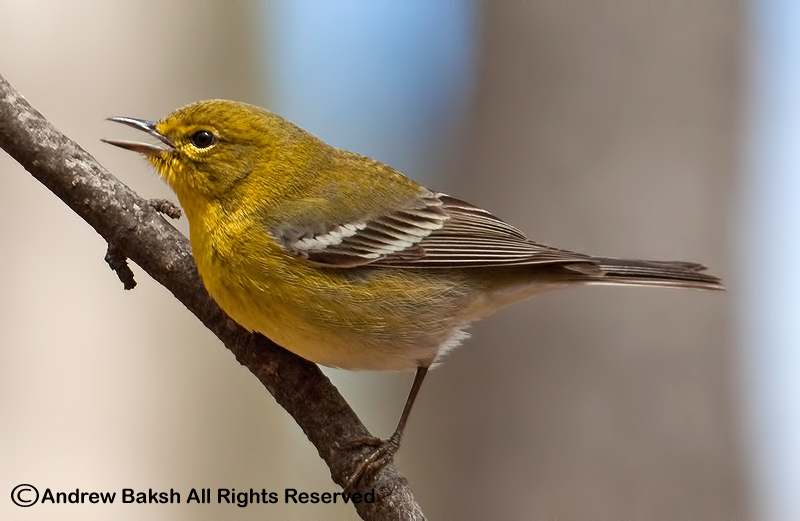 In the last week, New York City, has seen a number of early Warblers moving through the area. 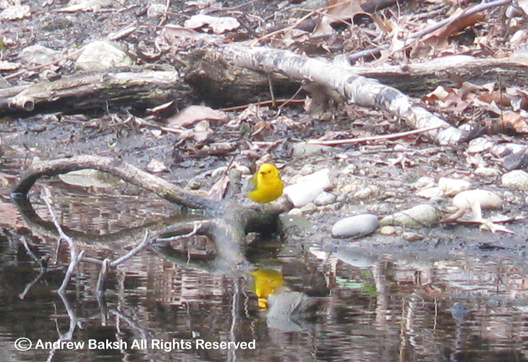 Yellow-throated and Prothonotary Warblers have been the top billing so far. 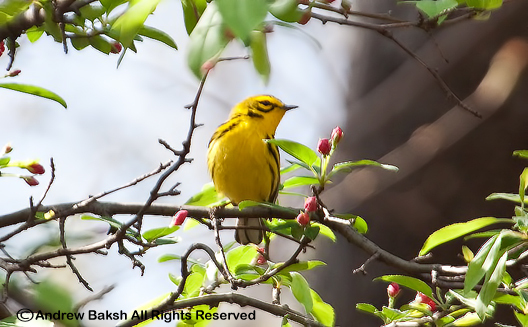 At least 4 Yellow-throated Warblers (Dendroica dominica) have been reported in several notable birding hotspots. 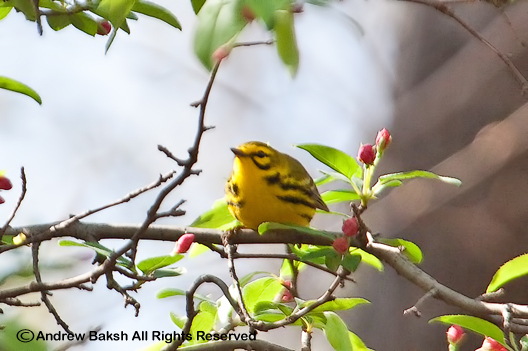 April 10th, at Prospect Park Brooklyn, birder Eddie Davis, found a Yellow-throated Warbler. The bird was seen by many and stuck around for a few days. 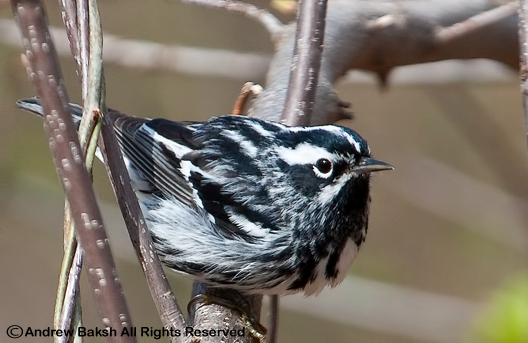 On April 12th, in Staten Island, Professor Richard Veit, found a Yellow-throated Warbler at Wolfe's Pond. 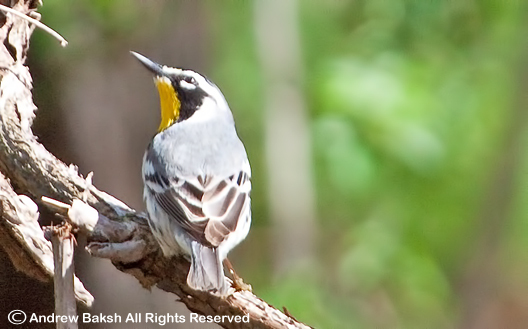 The very next day in Alley Pond Park Queens, a Yellow-throated Warbler was heard and seen by Queens County Bird Club member, Erik Miller. Unfortunately, no one else was able to see the bird and it was not re-found. 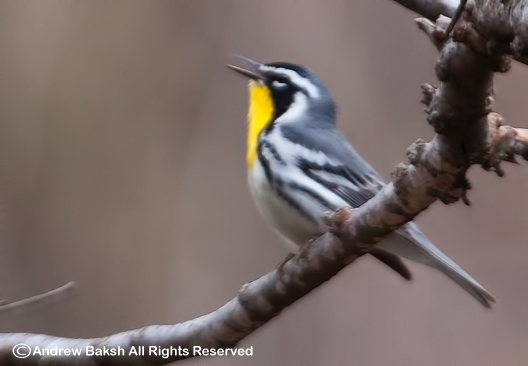 and lastly on April 14th, veteran birder Bobby Kurtz found yet another Yellow-throated Warbler at Hempstead Lake (Nassau county),which was seen for a few times in the morning and then was never re-found. I never got on any of these YTW, so this bird remains elusive for me as a state bird. 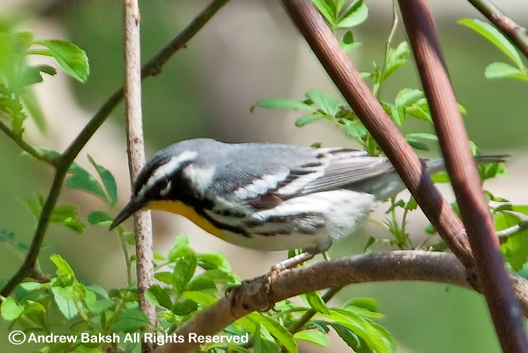 This past Thursday, another very good warbler showed up, this time in the Bronx, at the New York Botanical Gardens. A Prothonotary Warbler (Protonotaria citrea), which was apparently photographed by a visiting photographer. 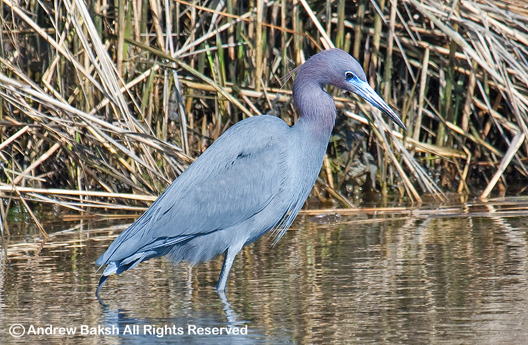 I was able to see this bird on Saturday after my Van Courtlandt bird walk and got great looks. 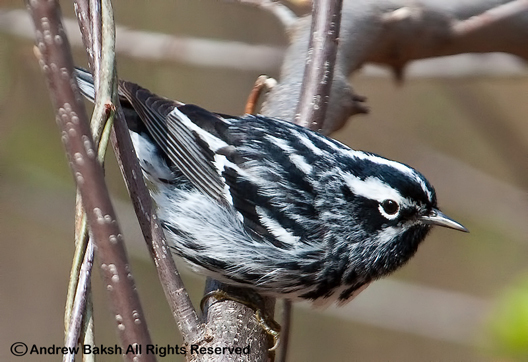 With these early treats, NYC birders are hoping for more goodies. 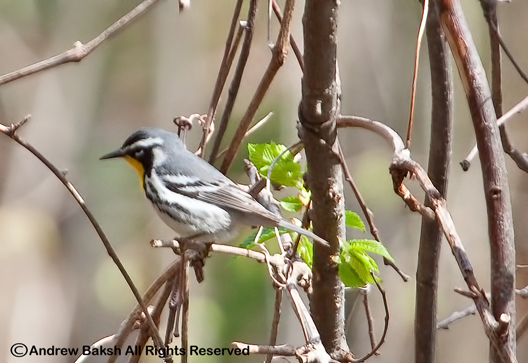 Here are a few warblers that I was able get decent photos of so far during this spring migration. Pine Warbler @ Van Courtlandt Park Bronx, NY. This past Saturday I was hoping that we would have better results than the previous week. 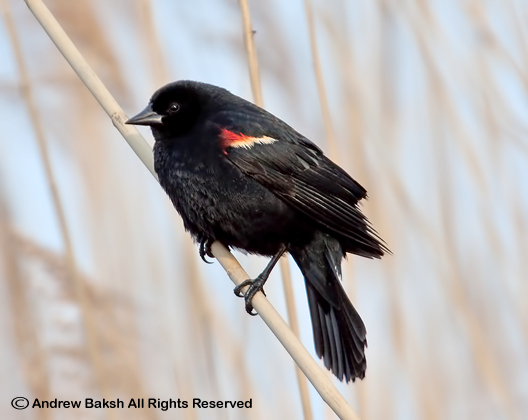 Our group, met up at the nature center near the parade grounds and after picking up a few Killdeers (Charadrius vociferus) American Robins (Turdus migratorius), Red-winged Blackbirds (Agelaius phoeniceus) and Brown Headed Cowbirds (Molothrus ater) on the fields we headed out to hike the lake. 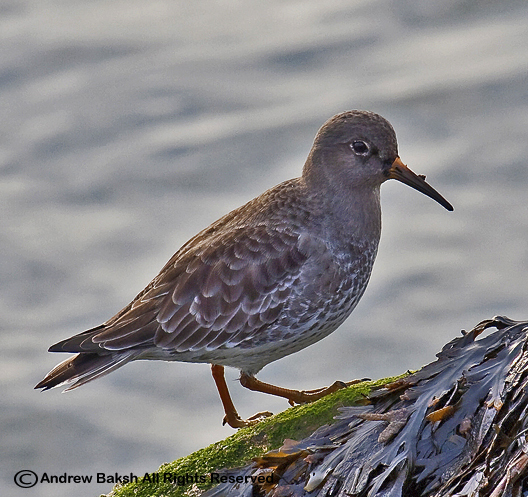 I was hoping for a migrant or two - perhaps a warbler, but like the week before, land birds and waterfowl were scarce. Nevertheless, we did manage nice looks at a Belted Kingfisher (Megaceryle alcyon), Great Blue Heron (Ardea herodias), Green Winged-teals (Anas crecca) and Wood Duck (Aix sponsa). From the lake we hiked up Vault Hill losing a few of our attendees in the process. Vault Hill was quiet, but I heard an Eastern Phoebe and American Goldfinches and that gave me hope for the woods. We hiked the woods picking up multiple Hairy, Downy, Red-bellied Woodpeckers and others. We also had our first of the season Northern Flicker (Colaptes auratus), which kept tantalizing us with somewhat distance looks. 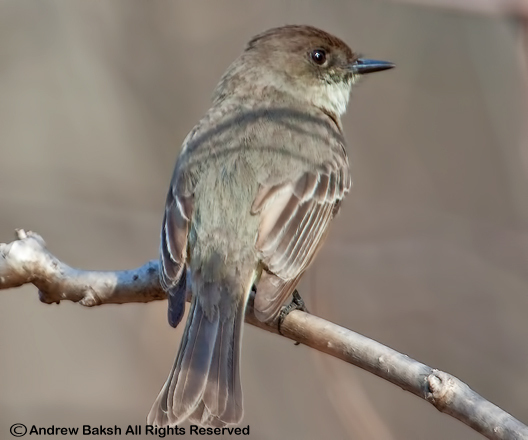 On our way out of the woods, I finally locked on an Eastern Phoebe (Sayornis phoebe) and tried to get the group on the bird though it proved rather tough. 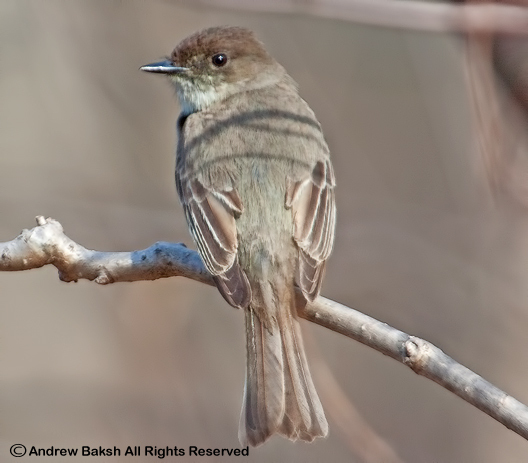 Undeterred, we continued to work the area where the Phoebe was seen and eventually a few of us got on the bird. 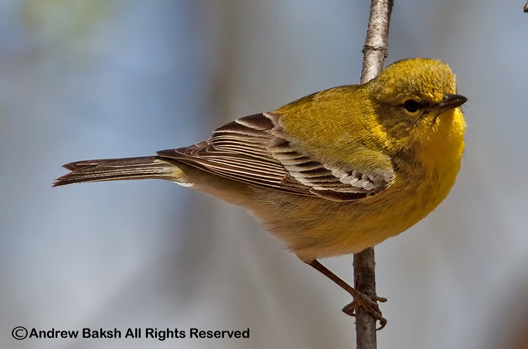 While we were working the Phoebe, I picked up a flash of olive near the ground and I thought of warbler. 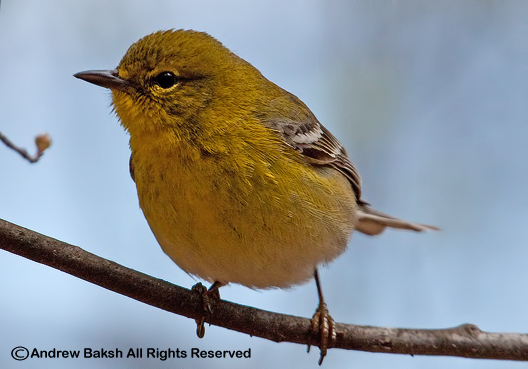 Sure enough, I tracked down a Pine Warbler (Dendroica pinus), which was insect hunting and moving around quite a bit. It took some work, but eventually everyone got on the bird. In the same area we added a second Pine Warbler (Dendroica pinus) making two for the day and the highlight of the walk. 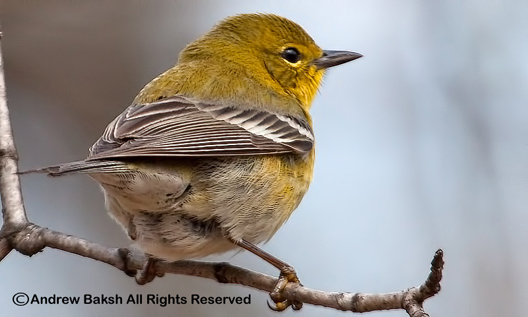 I was very happy for the group and was even more thrilled that Robin, one of our regulars and a new birder was able to pick out one of the Pine Warblers amongst the shrubs with her naked eye. Here is a list of the species seen. 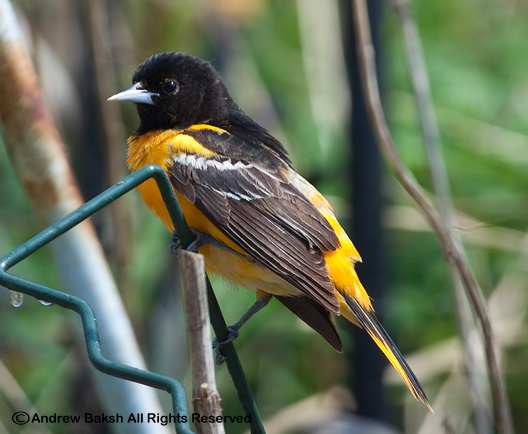 Help support birding activities and habitat restoration at Van Courtlandt Park in the Bronx NY, by participating or being a sponsor of the Van Courtlandt Park BIRD-A-THON. See below for more information. 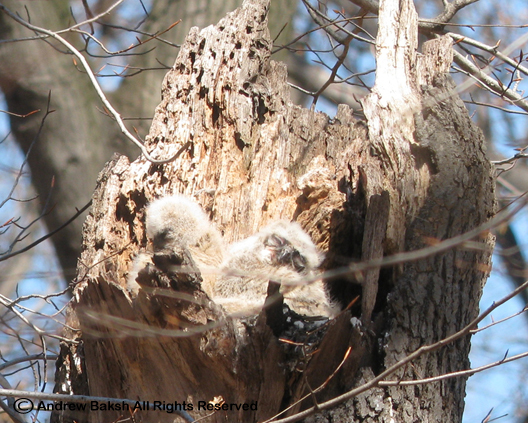 Zzzzz...these Great Horned Owlets had the right idea. Too bad I couldn't find a cavity to fit me. Looks to be in deep thought, I hope they both make it. Not too far away, Mama keeps a watchful eye. This past Saturday, I did not have any walks scheduled, so I figured it was perfect for a day of "field study". No chasing or twitching - just birding with an approach to soak in whatever I saw and hope for a glimpse of spring arrivals. 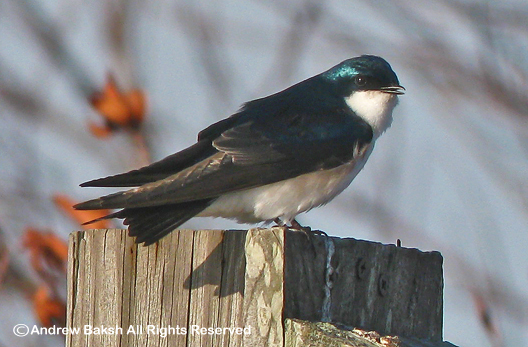 At Jamaica Bay Wildlife Refuge in Queens NY, I spent a good hour watching Tree Swallows (Tachycineta bicolor) staking claims to nest boxes and made a note to speak to National Park Service about possibly installing additional nest boxes. On the West and East Ponds, I was thrilled to observe Male Green-winged Teals (Anas crecca) displaying their courtship behavior in attracting mates. 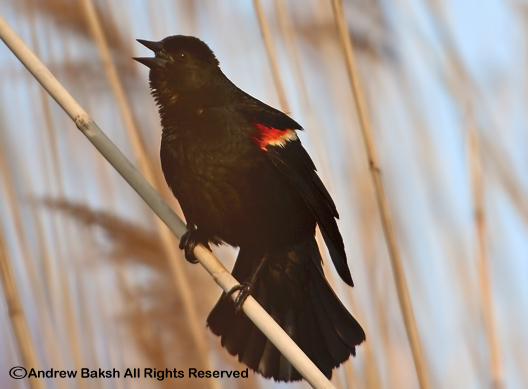 A few males did the “grunt‐whistle,” “down‐up,” and “headup‐ tail‐up”, displays. I also noticed that a few of the Male Green-winged Teals did the “bridling” display, which involves drawing the head backward. I would have loved to capture some video of this display, but the wind made it difficult to get any decent footage and the distance did not help either. A search on the internet did result in some footage which I have linked to here; I recommend you check it out...pretty cool stuff. 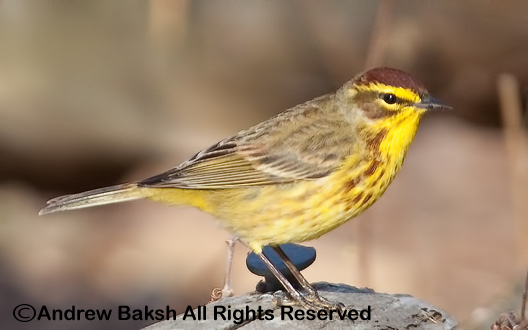 Other notables at JBWR included 8 Yellow-rumped Warblers and a couple of Northern Pintails (Anas acuta). 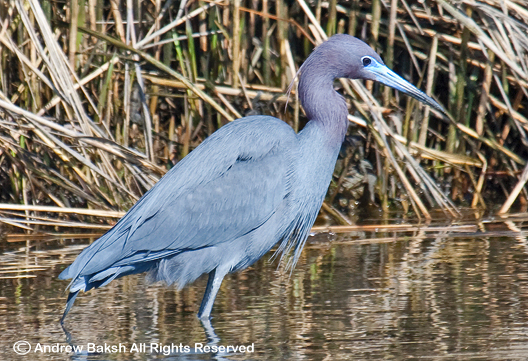 Later on in Staten Island, I had a lone Black-crowned Night Heron (Nycticorax nycticorax) and Snowy Egret (Egretta thula), more evidence of spring arrivals. On my way home I marveled at the Turkey Vultures (Cathartes aura) flying over Hylan Blvd in Staten Island and wondered if I would ever see such a scene in Queens. Well, as luck would have it, I had another Turkey Vulture, sighting though not in Queens, but in Brooklyn, on the Belt Parkway right near the Kings Plaza exit. My first Turkey Vulture sighting in Brooklyn. That was a fine way to finish my day out in the field though, my birding was not finished for the day as I turned my attention to my backyard birds once I got home, but that will be another post for another day.